$479.99 Seen a lower price? 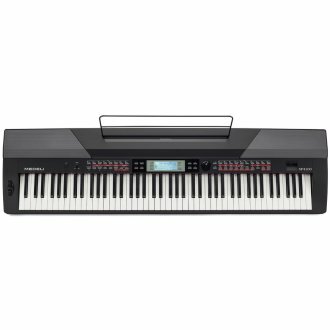 The Medeli SP4200 Digital Piano with 88 full-sized hammer action keys is the perfect digital piano for home or performance. The authentic piano feel can access 600 meticulously sampled voices with layering and split capability for lush sound combinations and performance setups. The easy to use control display allows you to fine tune your sound with the 24 on-board effects and EQ and you can get very creative using the 120 preset songs and 230 included play-along rhythms. The optional MESSP4200 stand comes with 3 piano style sustain pedals for total control of your sound. Same Day Music is an authorized dealer of Medeli products. - Piano Dimensions: 14.41" X 53.74" X 5.40"
Available until 11 PM (EST) today. Mention special code 20V-SH51 when you call.